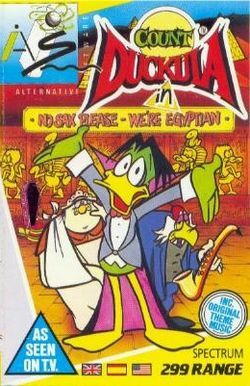 Count Duckula (full title: Count Duckula in No Sax Please, We're Egyptian) is: a platform game that was developed by Enigma Variations for Alternative Software, and released on the Sinclair ZX Spectrum, Amstrad CPC and Commodore 64 in 1989 (and on the Commodore Amiga in 1990); it's based upon the first episode of the Cosgrove-Hall, Carlos Alfonso Studios, and Thames Television series of the same name. Due to technical limitations, the ZX and CPC versions were presented in gray - however, the Commodore 64 and Amiga versions are presented in full colour (and the latter also incorporates an extra "snap" game, reminiscent of the Spade Panels in Super Mario Bros. 3). This page was last edited on 23 April 2015, at 16:09.